Every stress you experience, whether it’s a sleepless night or an argument, triggers a dual chain reaction that prepares you to physically respond to the stressor. 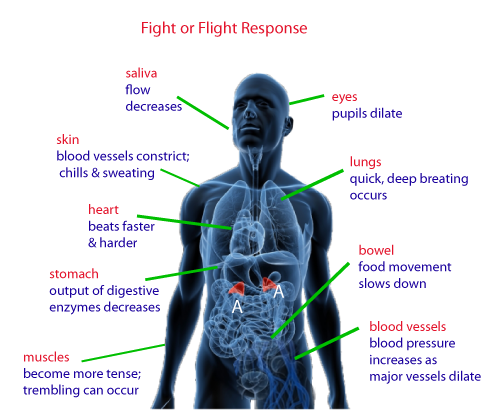 An initial alarm reaction happens before you’re even aware of it in which your brain and sympathetic nervous system directly stimulate your adrenal glands to produce epinephrine (adrenaline) to prepare every part of your body for immediate “fight or flight”. This is quickly followed by a stress response regulated through your hypothalamic-pituitary-adrenal (HPA) axis. It begins with a message from the hypothalamus in your brain and results in the secretion of adrenal stress hormones that prepare every part of your body to sustain “fight or flight” as long as necessary. In order to accomplish this, adrenal hormones are able to affect every cell and system in your body and brain. From the chart above, you can see how central your adrenal glands are to all the different effects your stress response has throughout your body. Below you can see the immediate effects adrenal hormones have on you during the “fight or flight” response. 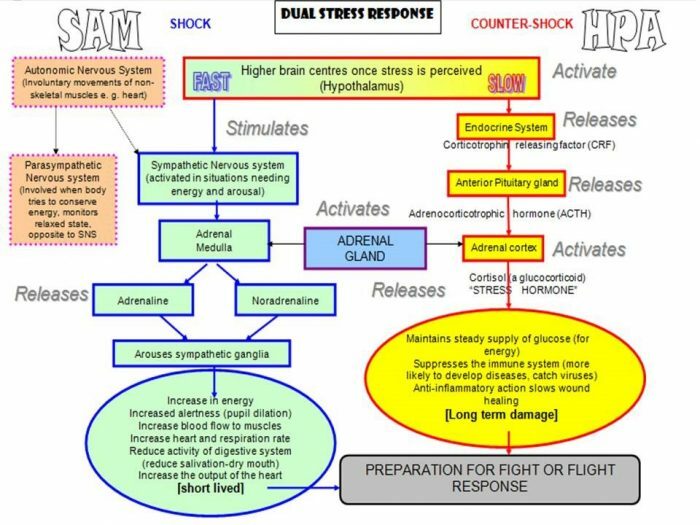 For some insight into how your adrenal stress hormones get triggered and why they can have different consequences for your health depending on the circumstances, imagine the three scenarios below. You’re walking down a dark alley and hear footsteps behind you; you walk faster and the footsteps speed up. You feel panicky, your heart starts to pound, your breathing speeds up, your gut and muscles tense, your palms sweat and you have a sudden urgent need to urinate; a wave of nausea and energy rushes through you while every thought but escape disappears from your mind. You take off running, making it to your car and speeding away to safety. After a while your heart and breathing slow down, your muscles and gut relax, you feel weak but slightly elated and your mind starts to race. Gradually everything returns to normal. This is the classic stress response – designed to protect you from harm through physical “fight or flight”. It’s been helping people survive physical threats (stressors) since the beginning. A few days later you think about that night and what might have happened and your body goes into stress mode all over again. This is the human ability to stress about imagined and anticipated threats. Mentally stressing about stress is actually stressful for your body. While stuck in traffic on the way to an important meeting, the daycare calls to say your child is sick and has to be picked up right away. You feel panicky, your heart starts to pound, your breathing speeds up, your muscles tense, your stomach feels tied knots and you feel like you want to run and scream while all you can think about is your frustration. You sit in your car fuming and by the time you rearrange your meeting, get out of traffic and pick up your sick child, you feel really tense. After waiting two hours at the urgent care with a feverish, whiny toddler, you feel ready to explode; your head and stomach ache and it’s hard to think clearly and calmly. You’re worried about your child but meanwhile work is piling up at the office and you worry about your job too. It’s impossible to relax. Welcome to the modern version of the classic stress response. Your internal response is the same but without the physical release of actual “fight or flight”, the consequences it has for your body are very different. When you look at all the physiological changes your stress response causes, it’s easy to see why a chronically stressful life could start to harm rather than protect you.